AS I TRAVEL THE BACK ROADS, an ancient tree, a lonely road, a vista or a dramatic cloud formation catches my eye and becomes a part of my collection of negatives, slides and digital images. Back in the studio, an image might be simplified as a study for a painting like "Dreaming of Cottonwoods in Autumn" above or enhanced for a fine art photograph or photo-encaustic work. Images currently in the studio as prints or paintings are listed below with sizes, prices and descriptions. 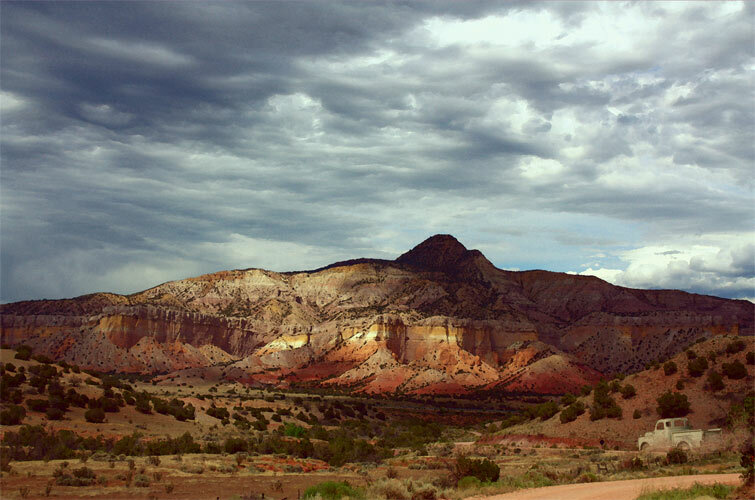 An approaching storm had the light dancing on the mesas and across the desert floor. This classic pickup was heading down the road from Christ in the Desert Monastery past Ghost Ranch ... hoping to beat the rain into Santa Fe. Maybe he was going to an exhibition opening; after all, it was Friday. This is literally the “point of no return” at Great Sand Dunes National Monument - the road from here over Medano Pass often disappears in drifting sand. 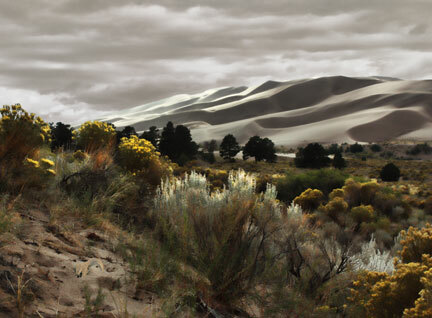 The tallest dunes in North America are the centerpiece of the park in a diverse landscape of grasslands, wetlands, conifer and aspen forests, alpine lakes, and tundra. Limited edition archival pigmented ink print on Hahnemuehle William Turner fine art paper with deckled edges. As we left Cochiti Pueblo one July 14th, having enjoyed seeing hundreds of dancers and feasting with potter Ada Suina and her family, we saw this threatening storm building up to the west. While at first thinking that a heavy rainstorm would spoil the day's festivities, we remembered - It's why they dance the Corn Dance in summer! May the rains come! Near the Visitor Center of Jemez Pueblo (Walatowa), this amazing outcropping of red rocks greets you, and is one of the few places on Pueblo land where you can take photo-graphs. I have attended more than a few pow wows and craft fairs there. Driving out of Chaco Canyon after a summer thunderstorm, the sky suddenly began to clear, presenting this desert vista. Only the distant mesas break the terrain as the entrance to the canyon is totally invisable from this viewpoint. Cerro Pedernal is a landmark in Northern New Mexico, visible for miles. The name is Spanish for "flint hill" and it is the source of a chert used by the prehistoric Gallina people. It was one of Georgia O'Keeffe's favorite subjects and her ashes were scattered on its top. 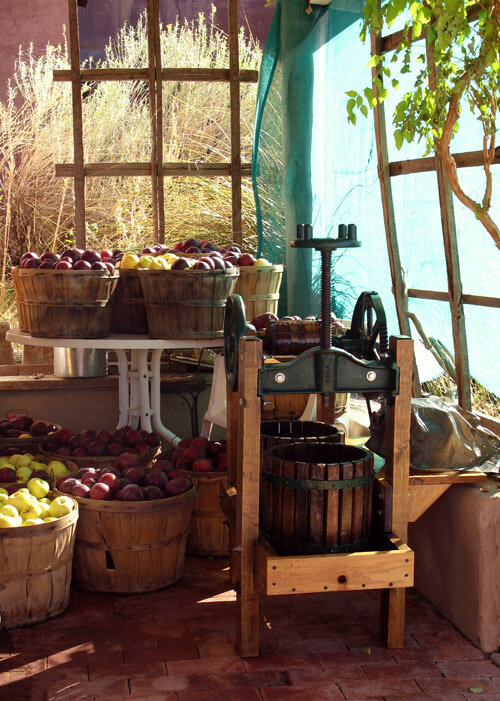 Working orchards still exist in Placitas, deep in the heart of the historic settlement, when we are blessed with enough snow to feed the springs that feed the acequias. This scene was discovered, not staged, and reflects the attachment to the land many traditional families value. The soil, the water and cold autumn nights produce some of the best apples available. Arches watercolor paper with deckle edges showing. 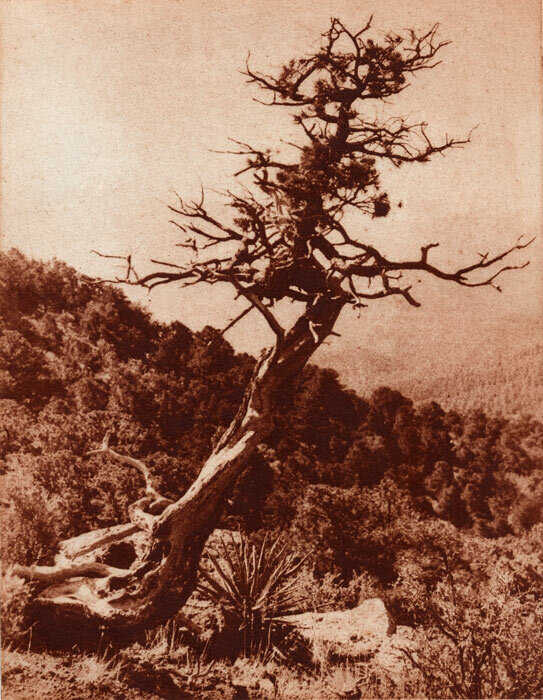 For many years this twisted Alligator Juniper greated us as we hiked the trail from The Dome Lookout into Bandelier Wilderness' Capulin Canyon. The terrible fires of 2011 probably destroyed it along with thousands of acres of Ponderosa forest. The image was printed from a solar plate. Only one framed (1/6) and one unframed (6/6) left in the edition.